The Olive Pink Botanic Garden was named after Olive Pink who was an infamous anthropologist. The great woman, in her time, strove for justice of the Aboriginal people. It is a native garden quite close to the town center in Australia. The garden is beautifully maintained with a variety of plants and relevant information based on them. The garden has a wide collection of over 500 species of central Australian vegetation. While rambling in the garden you would also find remarkable sculptures and art work that add to the beauty of it. You can easily while away your time at the kiosk that serves meals and drinks amidst the scenic beauty of the garden. There is also a visitor center in the garden that houses a couple of exhibitions every year. The entry to the garden is free. However they do ask for donation which isn’t mandatory. The staff at the garden is amicable and helpful. You may come across a variety of birds and honeyeaters. Train: Alice Springs Train Station. How popular is Olive Pink Botanic Garden? People normally club together Road Transport Hall Of Fame and Alice Springs Desert Park while planning their visit to Olive Pink Botanic Garden. Unique venue in the Botanic Gardens. Great place to sit and eat whether inside or out. I had a lovely chicken and quinoa bowl - very generous serving. Friendly service too! We only went to the cafe for lunch. Huge portions. I had nachos with vegs and avocado dip. Delicious.Great value for money. Very welcoming staff. Nice gardens We saw a lot of wallabies roaming around and one it the pouch Doesn’t feel like you are right next to the city Unfortunately the cafe was closed but it was still just as nice Easy parking for a motorhome when it’s not busy ! 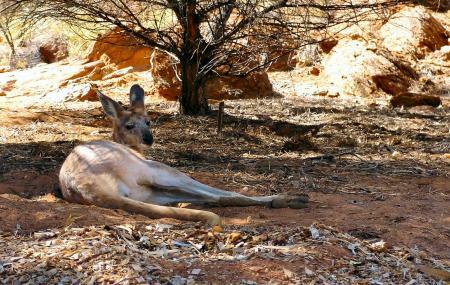 A great way to experience the nature of central Australia even if you have limited time or mobility, right in town in Alice!